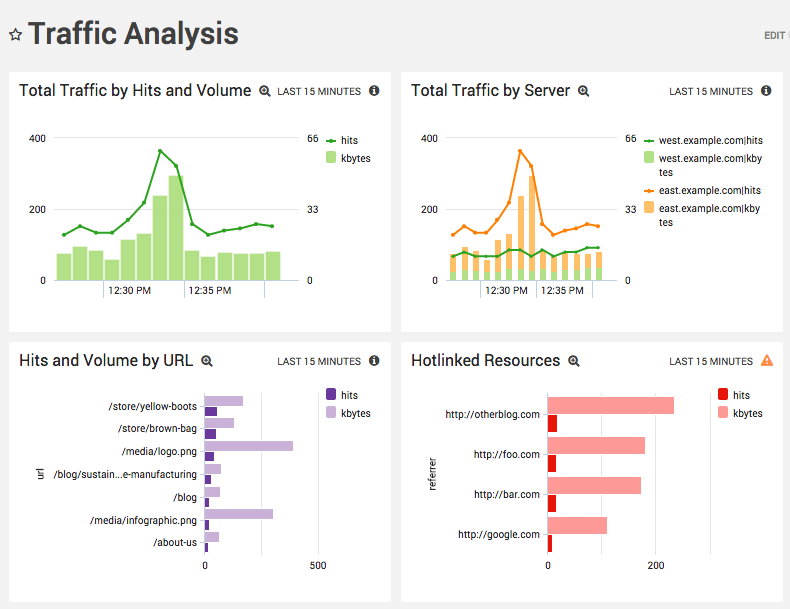 Apache access log analytics is about getting different kinds of visibility into your web operations. When it comes to traffic, we’re primarily concerned with two metrics: the number of HTTP requests (hits) and the total bytes served (volume). You can find all sorts of actionable insights by plotting these values against the other information in your access logs. 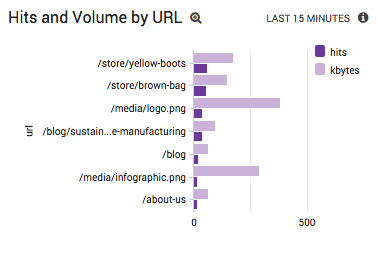 For example, comparing traffic to request URL identifies your most popular content, while visualizing hits and volume against referrer URL helps you pinpoint hotlinked media resources. In this article, we’ll learn how to identify these kinds of optimization opportunities by analyzing Apache traffic with Sumo Logic. You can follow along by signing up for a free Sumo Logicaccount. Sumo Logic adds a _sourceCategory metadata field to logs as it collects them. This lets us limit the scope of queries to either access logs, error logs, or custom log files that you’ve configured in httpd.conf. The _timeslice operator groups log messages into 5-minute intervals. Running this query returns a table counting the number of hits every 5 minutes. You can visualize this information by clicking the Line Chart button in the Aggregates tab. 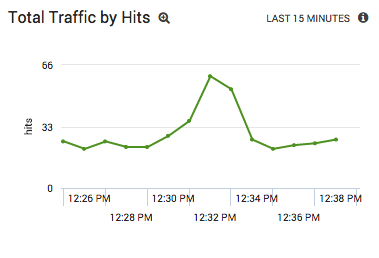 This gives you a much clearer view of traffic spikes. You can save this chart into a dashboard by clicking the Create Panel button in the Aggregatestab. 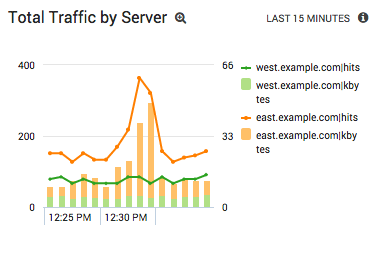 Dashboards are automatically updated in real time, so you’ll always know exactly what’s going on in your Apache infrastructure. Alternatively, if you have a Sumo Logic Professional account, you can set up a real-time alert to receive an email when hits pass a certain threshold. In either case, the idea is to keep tabs on key performance indicators with Sumo Logic’s monitoring capabilities, then dig deeper with ad-hoc queries when something needs attention. This gives you more insight into what kind of content you’re serving. If a small change in hits is accompanied by a big shift in volume, it means you’re serving a small amount of large responses. 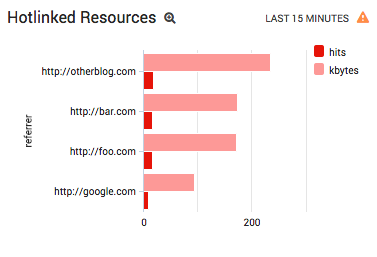 If your web application processes many small HTTP requests, you’ll see a closer correlation between hits and volume. These charts can help guide optimization efforts. In the former case, reducing response size will have the biggest impact on your web application’s performance. On the other hand, if you’re handling unnecessary HTTP requests, you’re better off refactoring your content to reduce the number of requests. If you’re maintaining multiple Apache servers, you’re probably also interested in how traffic is distributed amongst your servers. We can break down hits and volume by server using the _sourceHost metadata field. Like _sourceCategory, this value is set while configuring a source. This visualization provides a clear window into your entire web application infrastructure. For instance, if you’re monitoring a load-balanced cluster, this panel immediately tells you whether traffic is distributed correctly. Or, if you’re reacting to a denial-of-service attack, all you have to do is glance at your dashboard to see which servers require attention. Note that this is the same type of information we saw in the last two sections, but breaking it down by URL provides a new set of actionable insights. Note that the parse regex expression automatically drops all logs that don’t have a .jpg, .jpeg, .png, or .gif extension. In addition, the where clause filters out your own web pages (be sure to change example.com to your own domain). Visualizing the results as a bar chart quickly tells you which sites are the culprits. Again, change example.com to your domain so your own web pages aren’t blocked from retrieving image files. 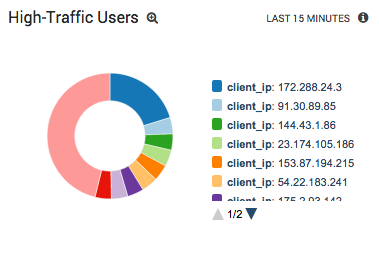 Finally, you can analyze traffic against client IP to find abusive users, misbehaving bots, and potential denial-of-service attacks. Note that this is only the first step towards finding malicious clients. Deeper analysis is required to determine if these IPs are scraping copious amounts of information from your application, trying to make your site unresponsive, or if they’re simply your best customers. The next article in this series explains more sophisticated ways to identify misbehaving robots. For more information about identifying and blocking malicious users, see Analyzing System-Critical Errors. 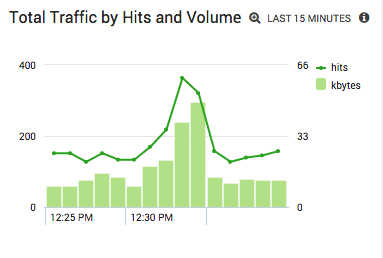 This article was about reducing traffic, measured in either hits or volume. We discussed ways to optimize application resources, prevent other websites from hotlinking content, and identify malicious users. One topic we didn’t cover was analyzing response time, which requires a custom Apache access log format.